So, the start of the eventing season is upon us. We’ve made it through the winter, the miserable cold/dark mornings, constantly brushing mud of your horse’s neck and legs. How on earth they manage to get so much mud on their eyelids is beyond me. The days are getting longer which means lighter mornings and evenings. Then throw in the odd sunny day and owning horses seems that little bit more bearable again. However, the winter has taken its toll on not just the horses but ourselves as well. Not all of us are in our finest form. Time to focus on rider fitness and get back in shape for the season ahead! We have probably all been super busy bringing our horses back into work. Getting them fit and getting out to some dressage and show jumping practice in the early months, to try and prepare your horse for their eventing debut. We all know how important it is that we get our horses fit for that first event. But do you ever stop to think about your own fitness and how that might affect your horse’s way of going? I’m sure a lot of us tend to over indulge at Christmas, resulting in us carrying a few more pounds than we should come the New Year. With all those dark evenings during the winter months, how on earth do we have time to worry about our own fitness? In previous years I have definitely been guilty of this and not worked on my own rider fitness. However, this year I decided it was time to make some small changes. Early on in the year I had my physiotherapist out to check my horses and she found that Humphrey was much stiffer on the one side. You assume this is the horse, but I suddenly thought what if this is being caused by my own weaknesses! A bit of a light bulb moment right there! From that point on, I had a mission to make sure I was stronger and fitter and evenly balanced as a rider. If one side of me works better than the other, then this is bound to transfer onto my horse. What to do about it? As I need to save up all my pennies for my coming Eventing season, paying an expensive gym membership was just not an option. To improve my rider fitness I have been trying to squeeze in a short workout from the comfort of my own home. Using YouTube on my new smart TV (but a laptop or tablet works just as well) I’ve found many different workouts to choose from. I have been trying to concentrate on Pilates and exercises that work on strengthening my core. I can then add the odd cardio class into the mix to keep it varied and interesting. Make your exercises specific to your riding. Think about what muscles you use and where your weaknesses are. Is your core strong enough? Do you have one leg stronger than another? Do you lack flexibility? Is your balance a bit iffy? Do you come out of the ring out of breath, should you focus on cardio fitness? Then try and come up with an exercise plan that works for you. Once you’ve set a plan make sure you measure your progress. Maybe record how you have felt after each workout, if you have managed to go for longer or increase the amount of repetitions. Keeping a little diary is a great way to do this. Make sure you are not over ambitious. Start slowly and come up with a program that you can complete. Even if you find it too easy to begin with, you can always build it up from there. Last of all make your rider fitness goals time based. Set a deadline for when you want to see an improvement. For example, maybe you want to be able to complete your first cross country round of the season without feeling out of breath. Or maybe you want to be able to ride a whole dressage test in sitting trot before you do your first Novice? This will mean you will get a sense of achievement when you achieve your goal. So how do I motivate myself to improve my rider fitness? I think it’s best to set a time of day, maybe in the evening just before dinner. Tell yourself that it is only 30 minutes and think about how much better you will feel afterwards. Set a realistic target for how many times a week you are going to fit in a session. Just remember, even 10 minutes of exercise a day or just spending a few minutes stretching before you ride can make a difference. Good Luck. Charlotte is an amateur event rider, currently on maternity leave from her job in the healthcare market. A new mummy to Isabelle, desperately trying to juggle motherhood and eventing with her two exciting young horses. Humphrey and Curious George. Humphrey has qualified for the Mitsubishi Motors Cup 2018 and will hopefully be out competing at novice before the end of the season. 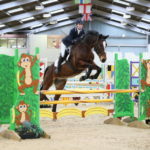 George is starting his eventing career this year, hopefully out to a couple of 5 year old classes.